I’m incredibly lucky to be able to visit so many of Ireland’s top restaurants and to have the opportunity to write about my experiences. I love travelling around the country and meeting the many passionate and hard working food producers, restaurateurs and talented chefs working here. I could never tire of listening to them talk about where they get their inspiration from. Their collective commitment to establishing Ireland as one of the world’s premier food destinations is something that I hugely admire and makes me feel proud to be Irish. I know that I may not garner much sympathy when I say this but there is also a downside to the work that I do reviewing restaurants. Whilst my understanding of food and ingredients grows with every meal that I eat, I also find that it takes something really special to stop me in my tracks and truly amaze me. Despite this, my enthusiasm for the restaurant scene in Ireland never wanes and I always feel a frisson of excitement when I dine somewhere that I haven’t previously visited. There have been a number of notable restaurant openings in the past few months but the one that I was particularly looking forward to was Canteen in Celbridge, County Kildare, a mere twenty-five minute drive from Dublin. In its previous incarnation Canteen operated from a small twenty seat restaurant in Blackrock Market with Head Chef James Sheridan at the helm. Sheridan ran the restaurant with his partner Soizic Humbert who was responsible for front of house operations and, under their joint stewardship, it quickly gained a reputation for serving some outstanding food. In many ways, this came as no surprise as Sheridan has a serious cooking pedigree having worked as sous chef to Michael Caines at the double Michelin starred Gidleigh Park in Devon and with Kevin Thornton, Graham Neville and at Sheen Falls Lodge here in Ireland. 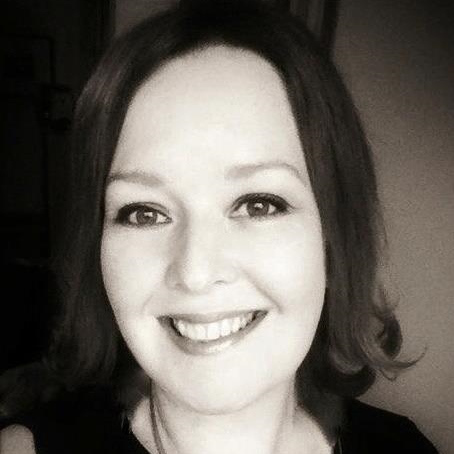 With the arrival of their son Cian, the couple decided to leave Blackrock and move the restaurant closer to Sheridan’s home town of Celbridge, finally finding suitable premises on the town’s Main Street. The new restaurant is long and narrow but manages to feel spacious and inviting and we happily took our seats at a wooden table beside the floor-to-ceiling windows. I wasn’t expecting the restaurant to be busy on the Tuesday evening that we visited so I was surprised to see that many of the tables were already taken. I took this to be a good omen. Canteen offers a very competitively priced Early Evening Menu consisting of 2 courses for €24 or 3 for €27 which is available from Tuesday to Friday (6pm to 7.15pm). A Dinner Menu is also available with 2 courses for €32 or 3 for €38, which we decided to go for. The menu was brief but well written and contained an interesting selection of dishes. Two linen pouches of bread were quickly delivered to the table with one containing perfectly hand-formed individual bread rolls whilst the other held slices of a very well made sourdough. Many restaurants buy in their bread but at Canteen they make their own. Both breads were wonderfully crusty with a chewy crumb and I found them deeply satisfying to eat. Amuse Bouches consisting of a Savoury Galette & Goat’s Cheese and a Crispy Flatbread Cracker Sandwich of Sausage, Cheese & Mustard Mayonnaise were served whilst we were still nibbling on the bread. Whilst both were delicious the sausage in the cracker sandwich was exceptional – juicy and full of deeply meaty flavours. 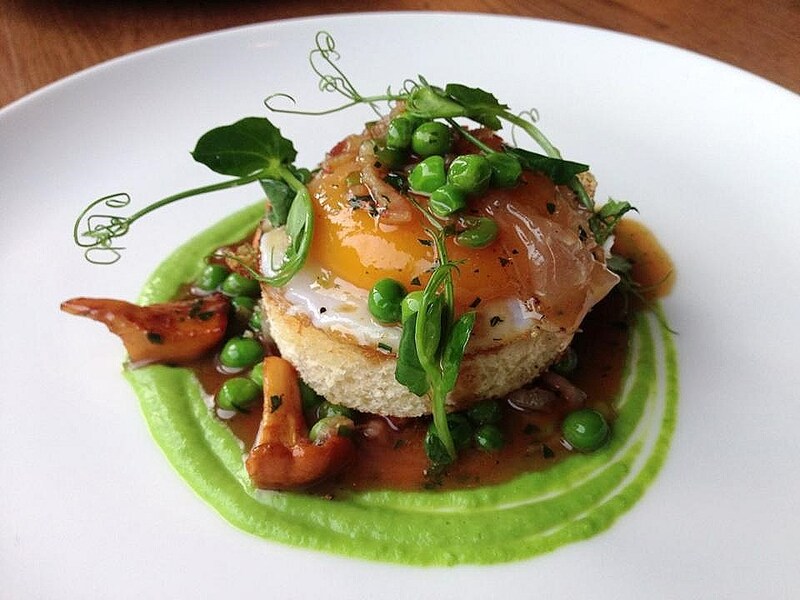 I quickly decided on the ‘Ham & Egg’ on Toast, Peas, Girolles and Jus Gras to start. This was a beautifully presented dish with a real wow factor and is the sort of food that really appeals to me; top quality ingredients treated simply but with a lot of care and attention to detail. It comprised a perfectly fried egg served sunny side up on a disc of toast surrounded by a swirl of almost fragrantly sweet pea purée and an umami rich jus gras. At its simplest, a jus gras consists of the dripping and meat juices left at the bottom of a roasting pan. This version also contained small ‘lardons’ of ham and was fantastic against the creamy egg yolk and the sweetness of the peas. The dish was finished with pea shoot tendrils which twirled provocatively on top of the egg but unlike many dishes where they are used merely for decoration, they served a purpose here and provided another layer of pea flavour. My guest for the evening was delighted with his Charred Mackerel, Oyster Mayonnaise, Granny Smith Apple & Cucumber starter. For too long, mackerel has been largely ignored on restaurant menus but thankfully its popularity is growing. As an oily fish, mackerel is best paired with ingredients that cut through its richness and in this starter it was perfectly combined with tart little balls of compressed Granny Smith apple. The smokiness imparted by chargrilling the mackerel added complexity to the dish whilst the cucumber cleansed the palate. This was clever cooking. We also decided to order another starter to share between us as we had found it impossible to whittle down our choices to just one each. The Pressed Chicken and Foie Gras Terrine, Beetroot, Verjus & Raisin Dressing with its perfectly balanced flavours and textures did not disappoint. Foie Gras is classically paired with Sauternes where the sweetness of this famous french dessert wine with its waxy mouthfeel compliments the rich creaminess of the foie gras. To be honest, I often find Sauternes a little too sweet so I loved the wonderful balance between the acidity of the verjuice and the sweetness of the raisins in the dressing that accompanied this terrine. Both main courses were excellent. 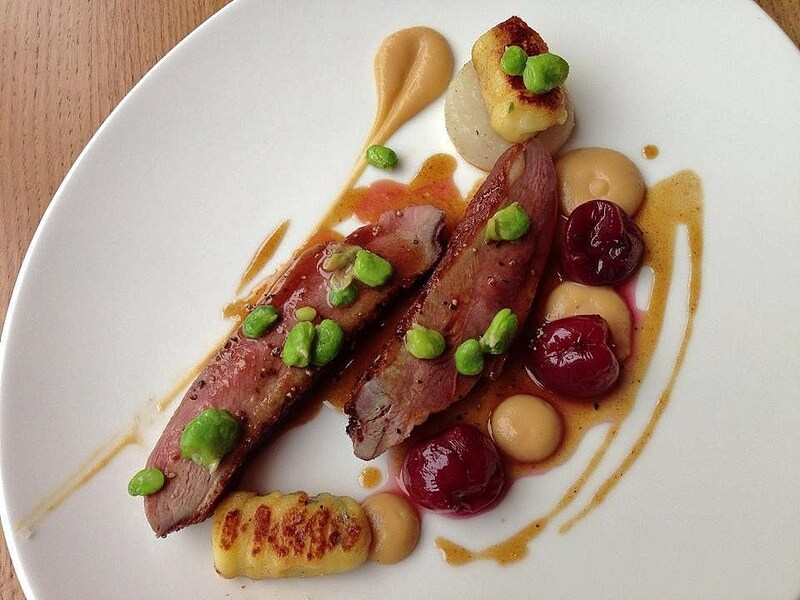 My Glazed Duck Breast, Cherries, Turnip & Broad Beans was another beautiful looking dish where the duck had been expertly cooked so that its skin was crispy whilst the flesh remianed succulent. Served with plump juicy cherries, turnips and broad beans, this was a lovely summery plate of food. My guest’s Chargrilled Black Angus Beef, Blade Croquette, Roast Shallot, Sauce Choron was substantial fare that pleased on a number of levels. 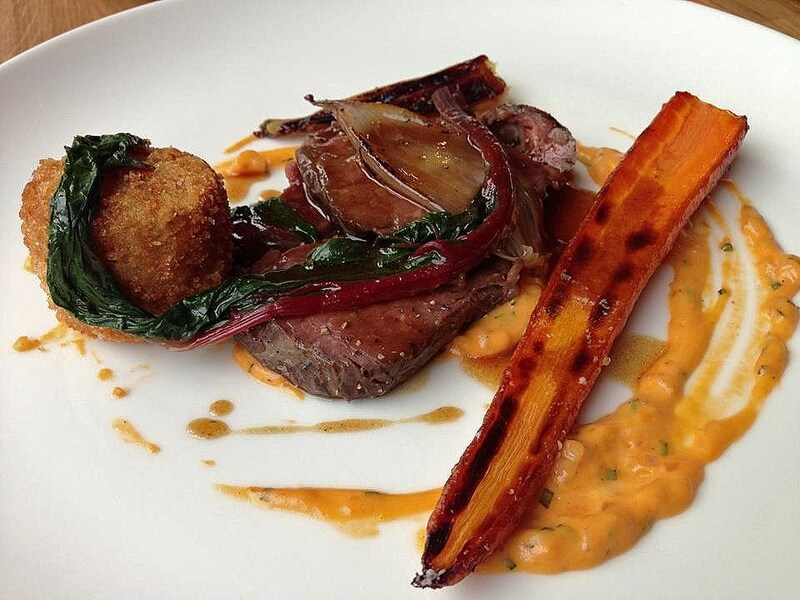 The beef was meltingly tender and tasted wonderful against the charred onion, sweet roasted carrot and the perky Sauce Choron – a variation of Béarnaise Sauce but with tomato purée and tomato concasse used in place of tarragon or chervil. However, the true star of the show was the croquette packed full of unctuously soft and flavoursome blade beef. It was superb. To accompany our meal we decided on a couple of glasses of wine each from the small but nicely chosen wine list. My 2014 Clos la Coutale Malbec from Languedoc Roussillon in France (€9.25), with its nose of blackberry, was beautifully smooth on the palate and the perfect accompaniment to my duck main whilst my companion’s 2013 Monte del Fra Bardolino from Veneto (€7.75) was full of juicy red soft fruit flavours that stood up well to the beef. We also supped on unlimited sparkling water which, along with filtered still water, is available at €1.50 per person. 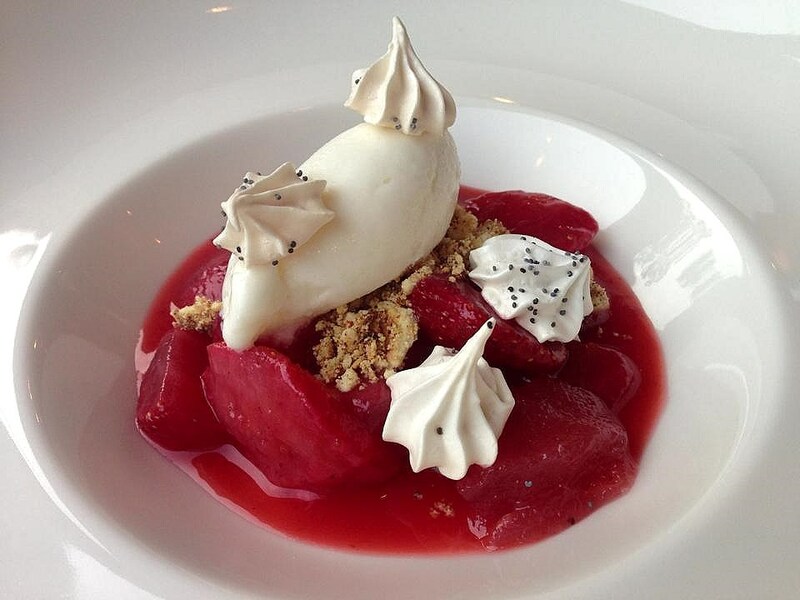 We finished our meal with a bowl of delicately flavoured Wexford Strawberries, Elderflower and Yoghurt Sorbet. This was a delightful dessert that was suitably light and refreshing after the richness of the meal we had eaten. I particularly enjoyed the lactic freshness of the yoghurt sorbet against the fragrant elderflower jelly. This was a lovely way to finish what was a memorable meal. I really enjoyed my meal in Canteen and loved James Sheridan’s food which is rooted in the classics but brought up to date with lots of clever ideas and interesting ingredient combinations. This is without doubt one of the most exciting restaurants that I have visited in 2016 and I can’t wait to return. Service throughout our meal was marvellous, attentive without being intrusive and delivered in a friendly and professional manner.